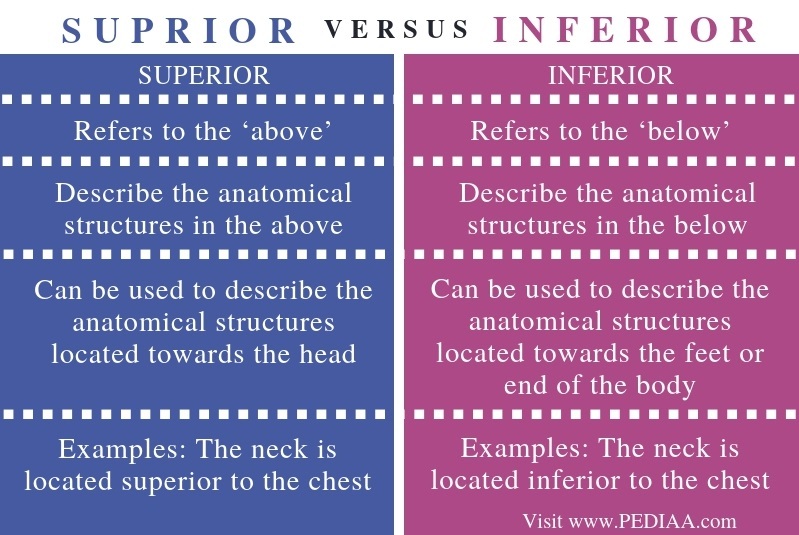 The main difference between superior and inferior in anatomy is that the term ‘superior’ describes the anatomical structures located above another whereas the term ‘inferior’ describes the anatomical structures located below another structure. For example, the head is the most superior structure of the body while feet is the most inferior structure of the body. Superior and inferior are two anatomical terms that describe the location of different structures of the body. ‘Superior’ is the anatomical term that describes the structures of the body located above a particular structure. Moreover, this term comes from the Latin word ‘above’. In humans, the head is the most superior anatomical structure of the body. Therefore, the term ‘superior’ can also describe structures towards the head. Additionally, this term can be used to give the relative position of a particular anatomical structure of the body based on the altitude. For example, the neck is located superior to the chest. ‘Inferior’ is the opposite term of superior. The term can describe the structures located below the body. It also comes from the Latin word ‘below. Moreover, the anatomical position the most inferior part of the human body is the feet. Similarly, the term ‘inferior’ can describe the structures towards the feet in the human body. Additionally, in other animals, this term can describe the structures located towards the end of the body. 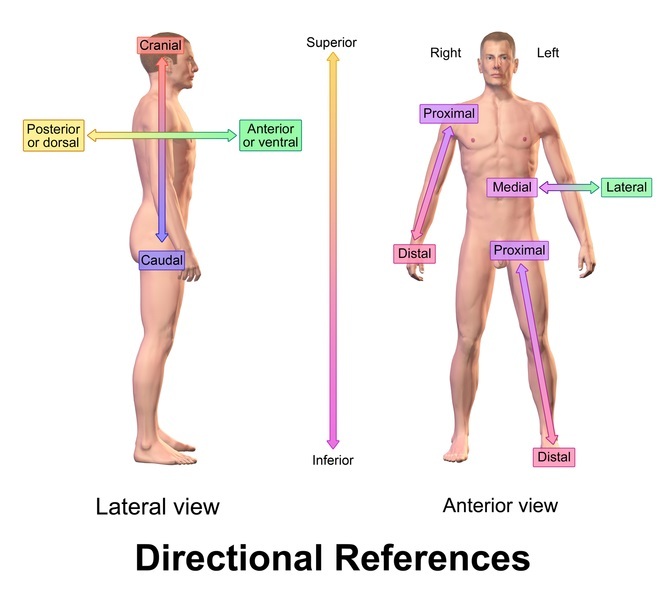 Moreover, when describing the relative position of an anatomical structure, we can use the term ‘inferior’ can describe the structures located below to another particular structure. For example, the neck is inferior to the head. Superior and inferior are two anatomical terms in anatomy. 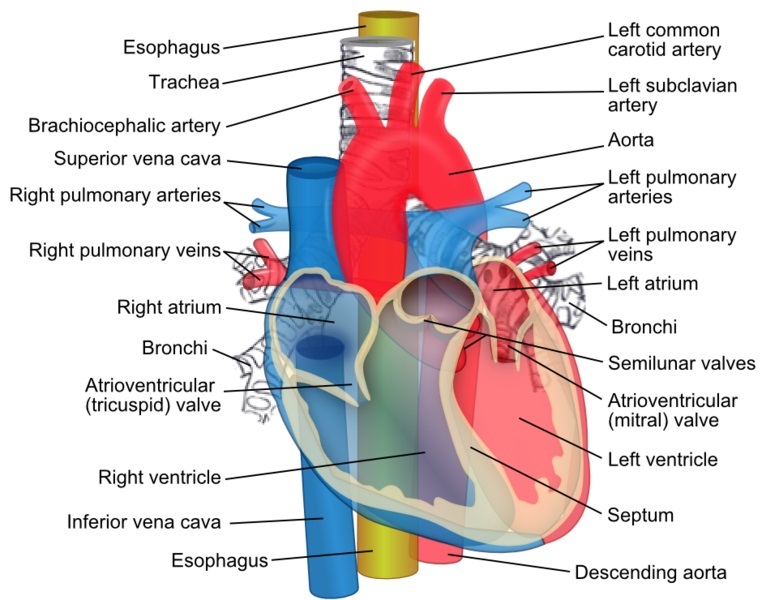 Moreover, they are important in describing locations of different structures of the body. Superior refers to ‘above’ while inferior refers to ‘below’. The term ‘superior’ is used to describe the anatomical structures above while the term ‘inferior’ is used to describe the anatomical structures below. Thus, this is the main difference between superior and inferior in anatomy. Also, another difference between superior and inferior is that the term ‘superior’ can be used to describe the anatomical structures located towards the head while the term ‘inferior’ can be used to describe the anatomical structures located towards the feet or end of the body. In humans, the neck is located superior to the chest, but inferior to the head. Superior is the term used to describe anatomical structures located in the above. Therefore, the head is the most superior anatomical structure in humans. On the other hand, inferior is the term used to describe the anatomical structures located in the below. Therefore, feet are the most inferior anatomical structure in humans. Also, these two terms can be used to describe relative positions of the anatomical structures of the body as well. Therefore, the main difference between superior and inferior in anatomy is the relative position of anatomical structures by means of altitude. 1. Mraz, Stephen. “The Difference between Medial and Lateral, Proximal and Distal, and Superior and Inferior (Biomechanics).” Machine Design, 8 Aug. 2016, Available Here.